PHOENIX — Sporting a brace on his left knee, former Suns center Alvan Adams arrived at Arizona Veterans Memorial Coliseum in a white T-shirt, a grey long-sleeved shirt underneath, a tan fisherman’s hat, black sunglasses and khaki shorts running just above his kneecaps. The man went 60 years without knee problems. He’s now 61. "It’s finally getting a little sore," Adams said. "That’s what happens to guys who jump high and land hard. But it’s OK, I’m ready to plant." 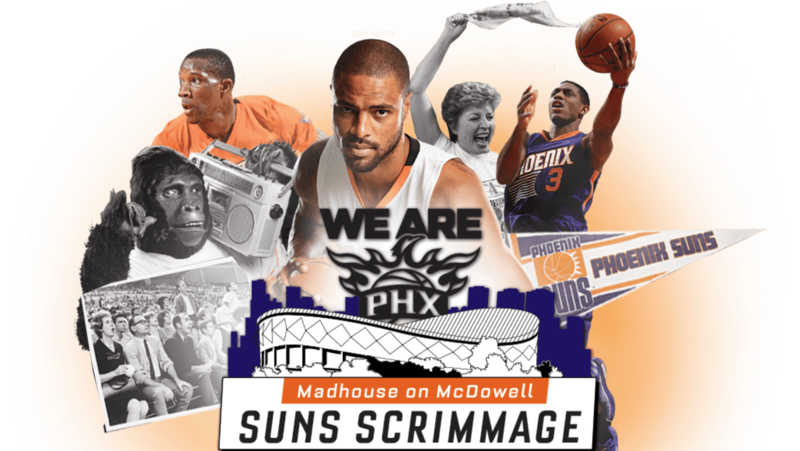 That is what Adams and more than 20 other people did last week at the Coliseum, also known as the "Madhouse on McDowell," as the team works to rejuvenate the outside of its former home in anticipation of the Suns scrimmage there on Saturday to end training camp. Adams, Suns centers Alex Len and Henry Sims, and Suns ambassador to the community Steven Hunter joined other volunteers in potting and placing flowers and plants around the Coliseum, part of the "Suns Week of Service" that has players, executives, staff and volunteers participating in community events across the Valley. They also spray-painted logos with the team’s new marketing slogan, "We are PHX," and spray-painted signs reading "50th Anniversary Arizona Veterans Memorial Coliseum" to commemorate the building’s opening on Nov. 3, 1965. The Suns played at the Coliseum from 1968, when the team was formed, until 1992, when then-owner Jerry Colangelo moved the Suns to their current downtown home. The scrimmage on Oct. 3 will mark the Suns’ first time playing at the Coliseum since relocating to what was originally known as America West Arena and will soon become Talking Stick Resort Arena. Adams, now the vice president of facility management for the Suns, played at the Coliseum from 1975, when the Suns selected him fourth overall in the 1975 NBA Draft, until his retirement in 1988. His involvement with the beautification Wednesday brought him back to his playing days at the venue located on the Arizona State Fairgrounds. "It seemed like there were 100,000 people," Adams said. "It was like playing in one of those big football stadiums ’cause our crowd, it was full and it was loud and we had some really good teams in that stretch." When the Suns return from training camp in Flagstaff, Adams will return to the Coliseum, but not in shorts and a jersey. 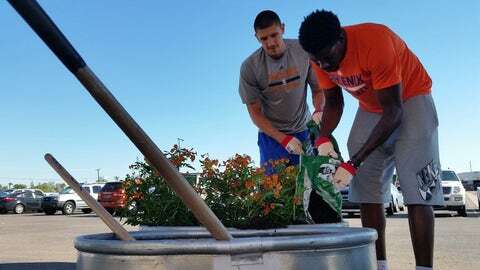 Suns center Alex Len (left) helps plant flowers outside Arizona Veterans Memorial Coliseum as the arena prepares to host a Suns’ scrimmage on Saturday night. "This one is going to touch the 10,000 or so fans that come to the free open scrimmage on Oct. 3 which is going to be fun," Adams said. "I’ll be there. I’ll be signing photographs before along with some of the old other guys who used to play for the Suns. And if they let me, (I’m) going to sell popcorn in the stands during the game." Len spray-painted the logo commemorating the 50th anniversary of the Arizona Veterans Memorial Coliseum at the front entrance. With the help of the Suns Gorilla, the two etched the "We are PHX" slogan as well, made official with their autographs above and below the sign. "How’d I do?" Len asked volunteers after spraying the anniversary logo. Above all else, though, Len said being out in the sun and planting were the bright spots for the day. "This takes me back to when I was at my grandparents," said Len, who as a child in Ukraine helped his grandparents plant fruits and vegetables.